WSSU Rams Helping Hands Food Pantry exists to combat food insecurity and ensure the human dignity of all and well-being on campus by providing in-need WSSU students with healthy, culturally appropriate emergency foods. Food insecurity, as defined by the United States Department of Agriculture (USDA) is having “limited or uncertain access to nutritious, safe foods necessary to lead a healthy lifestyle." Based on a poll that was conducted under the Office of Dean of Students in September 2015, 57% of WSSU students, who were polled, claimed to have gone without food because of a lack of funds. WSSU Rams Helping Hands Food Pantry is staffed exclusively by student volunteers and leaders who are trained to provide excellent customer service, to be respectful and kind to all, and to keep food pantry users' information confidential. The program is a collaboration between students, departments under the Office of the Dean of Students, and regional/national corporate sponsors. 100% of the original products gifted to the WSSU Rams Helping Hands Food Pantry were donated by Food Lion, Incorporated. Other resources to ensure sustainability of the WSSU Rams Helping Hands Food Pantry are the WSSU Simon G. Atkins Community Garden, the Winston-Salem Food Bank, and other corporate entities. WSSU students can access the WSSU Rams Helping Hands Food Pantry twice a month, obtaining up to five (5) items per visit. After utilizing the services for the first time (first time, up to five (5) items), a student is required to volunteer a minimum of one (1) hour back to the food pantry before utilizing the services again. The WSSU Rams Helping Hands Food Pantry is located in Thompson Center, third floor, suite 300 and operates on Wednesdays, Thursdays, and Fridays between the hours of 12:00 p.m. - 4:30 p.m. or by appointment. Forms for new user or returning users can be obtained and filled-out of this page. If the below forms are not filled-out and completed before visiting the food pantry, new users or returning users will have to complete the below form in office. If a student is unable to attend the food pantry during normal operating hours, the student must submit an email to wssuhelpinghands@wssu.edu stating the times and dates that he or she can attend or contact us at 336-750-3356. Please contact us with any questions or concerns. Our volunteers will be checking emails and voicemails daily for new messages. What Do I Do on Days When the Food Pantry is Closed? WSSU Rams Helping Hands Food Pantry users are encouraged to use the food pantry during the operating hours of 12:00 - 4:30 pm on Wednesdays, Thursdays, and Fridays. For those who cannot make those hours, please set up an appointment using our online Off-Hours Request form, sending an email to wssuhelpinghands@wssu.edu, or call our office at 336-750-3356. If Inclement Weather Occurs, What Should I Do? WSSU Rams Helping Hands Food Pantry will follow the university inclement weather policy, unless otherwise noted. Therefore, if you are aware of inclement weather nearing and you are low of food resources, please contact the food pantry by setting up an appointment using our online Off-Hours Request form, sending an email to wssuhelpinghands@wssu.edu, or call our office at 336-750-3356. Any WSSU students with a valid WSSU Ram Card can access the food pantry. Registered at-need students can utilize the WSSU Rams Helping Hands Food Pantry services only twice a month, getting up to five (5) items per visit. If you or someone you know is in need of emergency foods, please complete the Rams Helping Hands Food Pantry Application or contact us at wssuhelpinghands@wssu.edu. How Does the Rams Helping Hands Food Pantry Work? Each student must fill-out a New User Form OR the student can fill-out the form once the student comes to the food pantry located in suite 300, third floor, Thompson Center. Once the student fills out the documentation, a volunteer with the food pantry will then assist the student in gathering their items. Each student utilizing the services will be allowed to collect five (5) item, twice per month. 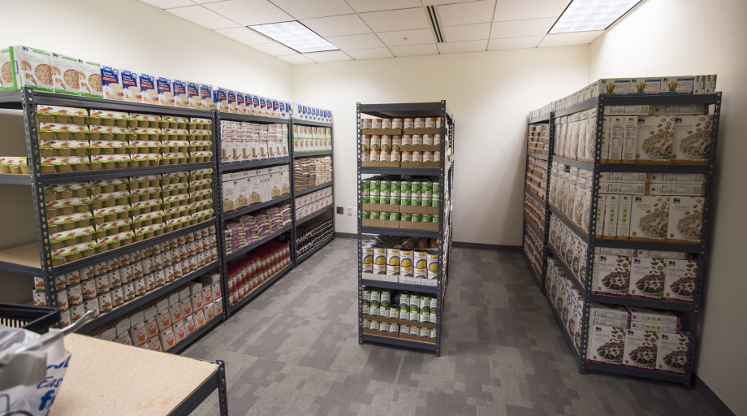 After the first time of usage, the student receiving services from the food pantry must volunteer at least one (1) hour of his or her time back to the food pantry before using the services again. The hours of operation for the food pantry are Wednesdays, Thursdays, and Fridays, from 12:00 pm – 4:30 pm. If adverse weather occurs or an emergency, please contact the Rams Helping Hands Food Pantry at wssuhelpinghands@wssu.edu OR contact the Dean of Students Office via 336-750-3356 for a faster response. If you need additional resources, you may utilize the WSSU Community Garden or other resources listed under Additional Resources tab under Helping Hands section. If you have specific dietary restrictions and our products do not meet your strict needs, please contact us to let us know how we can further assist you in your food needs. Another resource to best guide students in gaining information they need to make healthier choices is The Student's Guide to Nutrition created by BestColleges.com. This guide assist students in making healthier food choices based off of the food groups and appropriate sugar intake individuals are supposed to have to live a happy and healthy life. We welcome any person, class, and organization that would like to volunteer with WSSU Rams Helping Hands Food Pantry! Volunteers are the backbone of our organization and must commit to whichever shift they sign up for. Anyone who wants to volunteer at the WSSU Rams Helping Hands Food Pantry must be debriefed on our process. Volunteer training is very quick and can be done on an individual basis or done as a group. Please complete the WSSU Rams Helping Hands Volunteer Form or if you are an organization the Rams Helping Hands Organization Volunteer Form. If a group or organization needs to be debriefed, please submit an email to wssuhelpinghands@wssu.edu and let us know the name of the organization, dates that work best for the organization or group, and timeframe that works best. If you have any questions or want more information about getting involved, please contact us. Holding food drives and making donations (both food and monetary). Holding information sessions in classrooms, lectures and residence halls. Volunteering in the Simon G. Atkins Community Garden. If you are interested in supporting the WSSU Rams Helping Hands Food Pantry outside of volunteering during our open hours on Wednesdays and Thursdays, please email wssuhelpinghands@wssu.edu. Any work done with our pantry counts toward service hours too!